I was feeling very low on Friday, and sometime around Friday at 10:00 pm I really hit bottom, finding myself crying as I was watching the scene from Cast Away where Wilson, the volleyball companion of Tom Hank’s character Chuck Nolan floats away, and despite his best efforts, Tom Hanks cannot swim out to retrieve Wilson. He cries out, “I’m sorry, I’m sorry,” as he swims back to the boat, abandoning Wilson to floating across the ocean by himself. Now, lest anyone reading this worry about me, Saturday I woke up to a sunny day and felt very good. So don’t worry, this was just a short blip, the kind of thing people far from home experience from time to time. I have certainly had days like this before, like my last day in Buenos Aires back in 2003 on my South American trip or sitting in a train station in Jining, China, abandoned and alone with the drunk and the insane surrounding me. Days when you realize that you are far from everything and everyone you know, that you have little in the way of support or help, that whatever comes your way, you’ll need to handle it on your own. Sometimes that can be an invigorating thought, but some days it can overwhelm you. Friday started out all right. It was cloudy and lightly raining, but I got up feeling good, doing some research for an interview I was going to have that day and ironing a shirt for the interview. The day started going downhill when I got a call telling me the interview had been postponed. The reason was sensible and doesn’t hurt my chances of getting the job (in fact, I have another interview with the company on Tuesday), but I think after spending an hour in the morning getting ready for the interview had pumped me up a bit, and the delay deflated me a bit. I didn’t really notice until later in the day though. I went out for a wander, as I do most days when I don’t have anything specific planned. 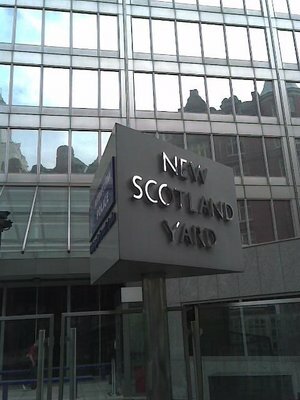 I went and saw New Scotland Yard for no other reason then they mention it on TV police dramas all the time and show that rotating sign, so I wanted to see it for myself. Just after I snapped my photo though, it started completely without warning pouring rain, and I got caught out for a good 30 seconds in a torrential downpour until I could find shelter. The rain stopped, and I went back to wandering around the area, but my clothes were still damp, and that put damper on my mood. I eventually grabbed some food at a pub before catching the train back home. Though I have certainly eaten alone in restaurants many times before, for some reason (probably my foul mood), it just struck me that I was eating alone in a restaurant full of people who were not alone. It could, in fact, get worse. About half an hour later on a trip to the bathroom the blister broke without my being aware, and I ended up tracking blood across my apartment’s floor and letting a good amount out on my white comforter before realizing what had happened. I cleaned up my foot and applied a band-aid. I walked back to my bed and surveyed the splotches of red blood on my white duvet. I sighed and then spent the rest of the evening listening to sad music and looking up depressing video clips on the internet, which is how I found myself crying as I watched a volleyball float across the water. I almost didn’t write this entry, as my moment passed quickly. This morning I woke up pretty happy, and after a load of white laundry felt even better to see all the blood removed from my duvet, I had a nice lunch of bagels and smoked salmon and a desert of fresh plums and all was right with the world. Why write about something, I thought, that is probably only likely to worry those back at home? When I moved to London I decide that I would use my blog, in addition to it’s use for documenting fun touristy things like Wimbledon or Stonehenge, to also document what life is like for someone who picks up and moves to a new country. That means both the good and the bad. If nothing else, perhaps there is someone out there tonight who has moved to a new place and finds themselves feeling lonely and low. This is reminder that you are not alone, others have felt the way you feel, some of them are probably feeling that way right now, and even more will feel that way in the future. This is also a reminder that tomorrow will be a whole new day, and things can be better. And finally a reminder that while we may have seen Wilson float away into the vast ocean, just because that’s the last we saw him doesn’t mean that what happened to him next was bad. 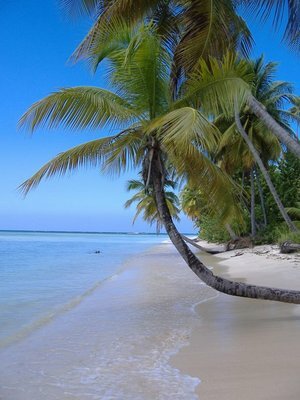 Heck, he could be sitting on a beach in Fiji right now, surrounding by beautiful native women and drinking Mai Tais. My first days living in Nigeria were pretty much devastating to me, new country, culture, new everything. I think what you did in recording it is good. Too many people don't mention that side of relocating. Then it hits them. Glad you are enjoying bagels again, and good luck on Tuesday.